A 15-day trip to Mongolia has some unique features, since we offer travelers a chance to see the most popular destinations in Mongolia, including interesting places in Ulaanbaatar (UB), the Mongolian Gobi Desert, Terelj National Park, Chinggis Khan Equestrian Statue, Western Mongolia, local Kazakh nomads, and the Eagle Hunting Festival in September & October. After a one-day city tour in Ulaanbaatar, you will take a flight to the southern part of Mongolia to explore the Gobi Desert. During the trip, you will be drawn to the natural attractions such as Flaming Cliffs that is recognized worldwide as the Mongolian Gobi, the large and splendid Khongor sand dunes, and the spectacular Yol Valley with its stream and high gorges, some ice and small rodents. The Mongolian Gobi is a very interesting destination to explore. Some of the ancient art monuments found in the Mongolian Gobi called Khavtsgait, are rock paintings from the Bronze Age. Created by prehistoric people, Khavtsgait is known for its motifs of various animals beautifully carved in the solid rocks. In addition to these natural attractions, you will have the opportunity to ride two-humped Bactrian camels across the dunes and visit a nomad family in a remote area to experience the real life of nomadic people. You may talk with them regarding their unique lifestyle. While exploring the Mongolian Gobi, you will be staying in the “Gobi Nomad Lodge,” which is a terrific camp in this region. 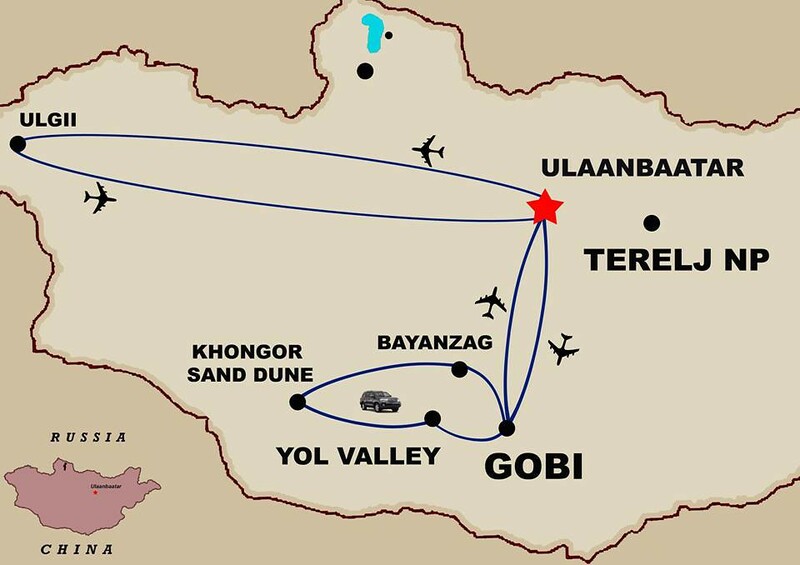 After spending 4 or 5 days in the Gobi Desert, you will fly back to UB to see the Chinggis Khan Equestrian Complex and the Terelj National Park. Chinggis Khan Equestrian Complex is a tourist attraction near Ulaanbaatar known for its wonderful architecture made out of 250 tons of stainless steel. After your visit to this complex, we will drive on to Terelj National Park, which is unique for its rock formations such as Turtle Rock. It is agreat place to witness alpine scenery, green meadows with wild flowers, and go horseback riding. You will also visit the meditation center in Terelj National Park, called “Aryapala”, which will give you good energy and fresh impetus. Continuing your Mongolian adventure, we will head to the Bayan-Ulgii Province in Western Mongolia, which is the home of many Mongolian ethnic groups. 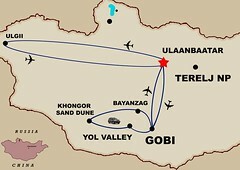 The duration of the flight to Ulgii is 2.5 hours. You will spend the first day visiting a local museum, a local market, anda Kazakh family to learn about their lifestyle and culture. The local museum maintains and promotes the cultural heritage of many ethnic groups in Western Mongolia.You will also have a chance to visit a popular workshop where locally skilled craftswomen make beautiful embroideries and handicrafts in a local town. You will visit an authentic eagle hunting family who lives near Sagsai County, which is about 25 kilometers (15 miles) from Ulgii town. During your visit, you will be introduced to the eagle hunting traditions, techniques, culture and nomadic lifestyles. It is an honor for these families to share their stories and show the tourists the eagle hunting gear that has been passed down from generation to generation. For the next two days, you will observe the Golden Eagle Festival, which begins with an impressive parade of participants holding their eagles while on horseback, plus several interesting competitions, an award ceremony, and a local performance in a nearby theater. Over 100-120 eagle hunters who have mastered the art of taming and using wild eagles will participate inthis Golden Eagle Festival every year. You will enjoy watching the main competitions between the owners and their eagles as they demonstrate the familiarity between the eagle hunter and trained eagle. You will see the competition between eagles as they attempt to catch a fox skin that is dragged by their owner on horseback. Other competitions during the Golden Eagle Festival will also be available for you to see, including a contest with men pullinga goat skin on horseback to show the horsemanship and strength of Kazakh men, camel racing, archery, and coin grabbing. After settling into your first ger camp, you will take a ride via 4WD vehicle to the paleontological site known as the Flaming Cliffs. This captivating area, with rock formations and cliffs alight in oranges and golds was named by Roy Chapman Andrews, an American explorer who spent two years searching the Gobi Desert beginning in 1921. Over the course of his exploration he unearthed dinosaur fossils and eggs about 10-15 cm in size. It was the first discovery of it’s scale and kind in the world. After breakfast, take in the stunning scenery of the Gobi-Altai Mountain range as you transfer to the towering sand dunes of Khongor Sand Dune, home to the ‘Singing Sands’. These spectacular dunes got their name from the noise made by the shifting sand in the wind. Feel the breeze in your hair as you ride a camel across the dunes before returning to the ger camp. Isolated from the rest of the country, the Singing Sands are the best kept secret for thousand years in the history of Mongolia. There is a beautiful green oasis known as Seruun bulag near the Khongor River. In the morning, we drive to Yol Valley. Learn about the local wildlife in the Natural History Museum before taking a gentle hike through the valley to discover their habitats. This valley is nestled deep within the hills and is a safe haven to get away from the desert heat. Some areas of the valley are continually sheltered from the hot sun and house huge, blocks of ice that gradually melt away during the summer. It is very wide at the entrance and narrows gradually into a remarkable gorge. You will get to see wild animals such as ibex and wild sheep, and the vulture. You can go horseback or camel riding around the area and go trekking to the gorge. Following an early morning breakfast, you will be transferred back to the Dalanzadgad Airport. We bid farewell to our drivers and fly to Ulaanbaatar where we meet our local transport for a 90-minute drive to Gorkhi Terelj National Park. This unforgettable excursion will take you to features such as scenic valleys, a winding river, and restful groves of trees. Many nomads live in the park itself, where they find lush land for their animals, and you may even see majestic herds of yak grazing near the camp. Once inside the park you will be able to visit the notable rock formations "Turtle rock" and “Monk reading a book." You will also have the opportunity to hike up to the Aryabal meditation center and learn more about Mongolian Buddhism. Today we will drive to Hustai National Park, which is world famous for the successful reintroduction of the Przewalski horse, called "takhi" by Mongolians. It became extinct in the wild in 1969 and, since 1992, has been successfully reintroduced to Hustai from zoos around the world. This has been an international effort monitored by The Foundation for the Przewalski horse, based in the Netherlands and MACNE (Mongolian Association for Conservation of Nature and the Environment). Following an early morning breakfast, we are driving back to Ulaanbaatar. Transfer to hotel. Rest of the day is open for you to pursue your own interest. Transfer to the airport for a morning flight to Ulgii (2.5 hours), capital of Bayan-Ulgii, Mongolia’s westernmost province. Ninety percent of the population here is Kazakh, Mongolia’s largest ethnic minority. The isolation of the Altai Mountains has preserved the language and traditions of the Kazakhs, who live amongst some of the most spectacular scenery in Mongolia. We will visit Kazakh families in their settlement. Their Gers are slightly larger than Mongolian Gers, and are decorated with brightly colored rugs. We will enjoy their hospitality and friendliness and learn more in deep about their culture. Ulgii (or Ölgii) is the capital of the Bayan-Ölgii Aimag (province) located in the extreme west of the country. It has an altitude of about 5,600 feet and population of about 29,000. It is the largest town in the area. It is the center of the predominately Kazakh region of Mongolia. The isolation of the Altai Mountains has preserved the language and traditions of the Kazakhs, who live amongst some of the most spectacular scenery in Mongolia. We will visit Kazakh families in their settlement. Their Gers are slightly larger than Mongolian Gers, and are decorated with brightly colored rugs. We will enjoy their hospitality and friendliness and learn more in deep about their culture. You will see their traditional technology to make colorful rug. We will be visiting some of the nomads of the area and experiencing their unique lifestyle. Kazakh craftswomen are renowned for their colorful embroidery and textiles, and their gers are beautifully decorated. Handcrafted felt carpets line the floor, and delicately embroidered tapestries adorn the walls of their homes, with each design unique to a particular family. After meeting a Kazakh, you will be impressed by the generous hospitality expressed through expansive meals with many dishes and countless cups of milk tea and sweets. The herder will also demonstrate his horsemanship and training techniques which have been passed down from generation to generation. The ger will be decorated with beautiful embroideries which are handmade by the skillful Kazakh women. The embroideries are truly works of art and display fine workmanship with beautiful colors and patterns. After breakfast, we will transfer to airport for return flight to Ulaanbaatar. In the afternoon there is more to see here upon arrival if you are interested, such as a visit to the Bogd Khan Winter Palace Museum, a residence of Bodg Jabzan Damba Hutagt VIII whom was Mongolia's last theocrat. Or take a leisurely stroll through the town center. In the evening perhaps you can enjoy a farewell dinner and attend the local folklore dance shows. Check out from hotel and transfer to Chinggis Khaan International airport for departure.